I thought I'd share some pictures from my weekend, including some of my garden in BLOOM!!! another who got to make her sissy jealous by relaying tales of the school field day! I guess I'd be jealous too if I had to miss out on games, popsicles, and face painting (see my "kitty kat" above after school!)!! I spruced up my kitchen by potting some organic herbs from Whole Foods in S&H's line of garden pots from T@rget! I think I may do a whitewash finish on these pots...what do you think? Mmmmmm....I love to use fresh herbs when cooking! Oregano, Mint, & Rosemary! Or from going to the Neighborhood Yard Sale!! I also spent some time in the Garden on Saturday and Sunday!! I had to spray all of my roses for little munchie bugs :(, and just generally enjoyed seeing everything that is bursting forth from the ground! Spring has definitely Sprung here!! Momma and Daddy Eastern Bluebird are seen often flying to and from the bluebird birdhouse! I think there must be a little bluebird family inside :)! Your flowers are gorgeous! My garden is a couple of months behind yours. Fun post Stacey. I love your new patio. We need to do the same spot in a shady spot we have. Your kitty is the cutest! Looks like you weekend was wonderful and the flowers are beautiful!! Sounds like a lovely weekend - minus the Dr. visit w/allergies. I love your photos! They turned out great! Just found your blog and am loving it! I got the white birdhouse at a flea market, and the "weathered" one at a local garden nursery, specifically for the eastern bluebirds!! Stacey, gorgeous photos!!! It sounds like a fabulous weekend, except for the sinus infection!! What a great weekend! Your strawberry picture was great. If you hadn't said that you took it I would have thought it was a flickr image. :) Good job! :) All your flowers are beautiful! Your roses are beautiful - I love roses. Don't like spraying them though! 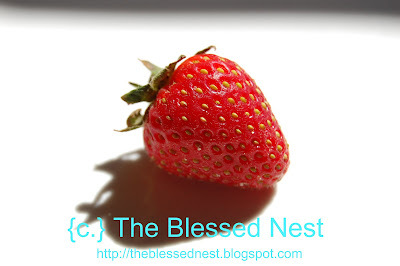 Love the patio and gorgeous strawberry photo! Oh my - I love the plants and the "patio." I've been working on making our tiny little porch an outdoor living space of our own. And while we don't have a garden, I managed to wrangle some impatients into a pot. I suppose it will have to do for now - at least pink flowers make everything pretty! :) Enjoy this fabulous weather! I love your garden...your sitting area is so very cute! I have been out weeding and Preening since 7am...what fun!